Big Red Car here. Lovely day in the ATX, hot, sunny and wholesome. OK, maybe not wholesome but I was running out of superlatives. So what? If you’re talking about Diana Nyad and her 110 mile swim from Cuba to Florida, you are talking superlatives, my friend. 1. Age is not an impediment to continuing to accomplish your dreams. 2. Persistence is one of the critical elements of success. 3. Dreams outlast failure and always have. 4. Age is not an impediment to world class physical performance. 6. The startup mentality can be found everywhere. Age is a false yardstick. One is only as old as one allows oneself to be perceived. 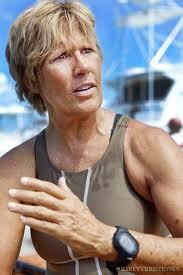 Diana Nyad is 64 years old and had been a swimmer her entire life. In Diana Nyad’s case, 64 is the new 34 or 24. The woman performed like a young woman. Her age is irrelevant when it comes to accomplishing her dreams and her physical performance. And why not? At age 64, she has made the distance between Cuba and Florida — a distance of 110 miles — look like a couple of laps in the local YWCA pool. Diana Nyad owned her dream. She had already swam around Manhattan in eight hours. No mean feat, eh? Yes, sayeth the Big Red Car. More importantly, Diana Nyad had failed — FAILED IN THE SHORT TERM ONLY — in her dream to swim from Cuba to Florida. But that did not dissuade her. She persevered and drove on — literally — until she accomplished her dream. “Nothing can take the place of persistence.” Look up this Calvin Coolidge quote, Old Sport. Look at Diana Nyad’s website for a keen glimpse into the ordeal that she has overcome. What Diana Nyad also demonstrates is the necessity of building a winning team, in her case a land bound and waterborne support team to drive her extraordinary effort. She was and is a startup founder and CEO envisioning the problem to be solved, raising the money to capitalize the effort, building the team to undertake it and then achieving product-market fit. She exemplifies the challenges — successfully met — of the startup CEO. The founder who snags the brass ring. But, hey, what the Hell do I know anyway? I’m just a Big Red Car and I can’t swim a lick. This entry was posted in Character, Inspiration, Persistence, Startups, Success, Talent and tagged diana nyad, inspiration, start up ceo, success. Bookmark the permalink. This woman has completely destroyed forever any age based excuse. My deepest admiration. When I grow up I want to be like her! She really is absolutely amazing. An inspiration even for a 47 year old convertible like me. Remember that car years are 3.5 people years. So, I’m really, really old.